I’ve seen the mesmerising Gigspanner live on quite a few occasions now (nine times in the past four years) and described their utterly unique performances here and here and here! 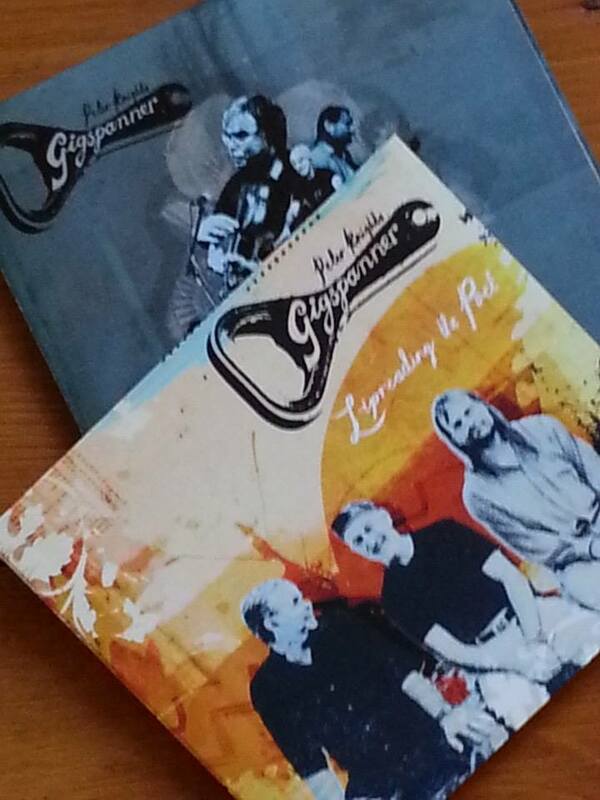 Gigspanner are ex-Steeleye Span fiddle player, Peter Knight, guitarist, Roger Flack, and percussionist, Vincent Salzfaas. What is different about tonight though is that they are joined by folk duo Phillip Henry and Hannah Martin – for what’s been dubbed the Gigspanner Big Band. I was always hoping this would be something special. But at the same time I didn’t want to see Gigspanner lose the essence of what makes the band so utterly unique into some generic worldy, folky sort of jam session. I needn’t have worried. Henry & Martin do bring something extra to the stage in terms the former’s awe-inspiring slide guitar and the latter’s additional fiddle and beautiful vocals. Yet at the same time they absolutely work with the grain of what makes Gigspanner the act that it is and adding to that rather than simply muddying it up. It was nice to some well-established Gigspanner favourites in the setlist tonight: Butterfly, Death and The Lady, Hard Times of Old England and King of the Fairies as well as a beautiful Banks of the Nile (which many will know from Sandy Denny’s back catalogue) sung by Martin. Gigspanner has always been a complete melting pot of musical influences: English folk meets Cajun jigs meets French waltzes meets African drumming and much more besides. And the guest duo certainly bring in a bit more of the English folk influence – but also, with the slide guitar, they bring an American country blues feel and, at times, traditional Indian influences, too, (Philips studied Indian classical guitar in Calcutta) which all add to the already rich texture of Gigspanner sounds and influences. It’s perhaps no surprise therefore that one of the biggest cheers of the evening comes when Peter Knight lets slip that the five of them are going to be making an album together. The venue itself also played a part in making this a special evening. Built into the cliff face in the 19th century as a church, it fell into disuse and disrepair in the mid twentieth century but was saved, given an extensive refurbishment and re-opened as a quite magical arts venue in the late 90s. A magical trio meets up with a magical duo in a magical venue. What more could we have asked for. Layers of Ages, Gigspanner’s long-awaited third album received numerous plaudits from folk reviewers when it was released last year. Deservedly so. Fiddle-player, Peter Knight, guitarist, Roger Flack, and percussionist extraordinaire, Vincent Salzfaas, have returned with another absolute gem. Bows Of London opens the album, a song exploring those age-old themes sibling rivalry, murder and haunted musical instruments made out of human bones (well of course…) What really adds to the macabre nature of the subject matter though is the beautifully calm, understated way in which Knight delivers the lyrics. Death And The Lady is another highlight. Coming in at over nine minutes long, dark, brooding electric violin blends with pounding conga drums and Spanish-flavoured guitar to create a wonderfully atmospheric soundscape. However, for those yet to experience Gigspanner it’s difficult to emphasise the breadth of musical influences that this band explore. There’s lots of well known traditional material on the album, of course. But folk doesn’t even begin to describe the vast range of sounds you get to hear coming out of the speakers when Gigspanner are playing. King Of The Fairies, for example, has a Latin American feel while Louisina Flack immediately puts you in mind of a furiously energetic Cajun hoedown. Not only have Gigspanner brought a fresh perspective on some really well-known traditional songs, the album revisits a couple of songs closely associated with Knight’s former band, Steeleye Span. There is a great version of Mad Tom of Bedlam which is given that unique Gigspanner treatment, as well as a new version of Hard Times Of Old England. The latter was recorded by Steeleye Span at the height of their rocked-up, mid-70s commercial peak. But it gets a thorough reworking here as a gentle, mournful ballad, providing a lovely finish to the album. Having played Gigspanner’s previous two albums to death over recent years, it’s been wonderful to finally have a new one to play over these past few weeks. And what a masterpiece it is, wholly deserving of all the praise it’s received thus far. It’s hard to believe that Gigspanner only appeared on my musical radar some three and a half years ago. It was May 2012 and at the end of an exhausting period in my working life I booked myself into a hotel and did little else but sleep for 48 hours – apart from, that is, venturing out to see Gigspanner who were performing nearby. Other than knowing that they had been put together by Peter Knight, who I had seen perform with Steeleye Span several times, I had little idea what to expect and was too busy/exhausted to do much in the way of research prior to booking a ticket. But on seeing them for the first time I was utterly enthralled and immediately hooked. I’ve seen Gigspanner some eight times now and everyone I’ve taken along to witness the trio has been similarly transfixed and has become a firm fan. But perhaps the most telling impact was on someone I didn’t know at all. At one of Gigspanner’s gigs I slipped to the bar at the back of the room midway through the performance and as I whispered my order to the barmaid she promptly burst into tears. “I was expecting a normal night at work like any other,” she explained. “But I can’t believe this – it’s just so beautiful.” The power of music. So what is it about Gigspanner? So many different influences come together: folk, classical, jazz, African, Cajun, Appalachaian, Aboriginal, Celtic rock, folk rock. The list goes on. You can hear so many different sounds coming together to create something totally and wonderfully unique. Classically-trained folk fiddle supremo, Peter Knight, works with percussionist, Vincent Salzfaas, and guitarist, Roger Flack, to build up an amazing texture of sounds. The musicians and their instruments don’t try and compete with one another and, although one of the trio is much better known than the other two, no sound dominates at the expense of the rest; such that the centre of gravity on stage subtly shifts from one to the other and back again as a tune builds up and the music ebbs and flows. Gigspanner have a new album out Layers Of Ages. And in order that I could experience the new material in a live setting for the first time, I’d deliberately not purchased it before tonight’s show. A number of traditional songs are given the unmistakeable Gigspanner treatment and are included in the setlist tonight. This includes a stunning Death And The Lady, where dark, brooding electric violin blends with beautiful Spanish-flavoured guitar and mesmerising, pounding conga drums. Bows Of London is another real highlight, one of the most macabre of songs in a genre that has always had a close association with the macabre. Sometimes known as The Cruel Sister or The Twa Sisters it’s a tale of sibling rivary, drowning and creating a musical instrument (haunted and self-playing of course!) out of the deceased’s bones. Knight’s sweet, calm and understated vocal delivery always provides for a dramatic juxtaposition with subject matter of this type. Other songs from the album, like a thoroughly reworked version of Steeleye Span’s traditional classic Hard Times of Old England and a superb Mad Tom of Bedlam, which were given an initial outing on last year’s tour, are included in the set again tonight. Like the two previous CDs, Layers Of Ages will be on my stereo many, many times from now on. The new songs blend alongside a number of old favourites from the Gigspanner setlist that I was particularly pleased to hear performed once again, songs like Seagull (Knight’s recollection of the shove ha’penny game played in the Lord Nelson pub up the road from our venue tonight in Hastings old town), as well as the stunning tunes Sharp Goes Walkabout and The Butterfly. It’s probably worth saying a word or two about Knight’s gentle but witty, self-deprecating banter, too, always bringing us back down to earth after being transported who-knows-where during each piece of music. So another Gigspanner gig tonight and another new fan: “I completely lost myself in that. I felt part of it,” was the verdict of one of our party tonight on hearing them for the first time. The audience response from a packed-out Stables Theatre, just as it was in the same venue this time last year, is rapturous. Thank you Gigspanner. Gigspanner is not Steeleye Span. In spite of the slight similarity in name and in spite of the presence of long-standing ex-Steeleye fiddle supremo, Peter Knight, Gigspanner are a different proposition from the folk-rock legends entirely. And utterly wonderful for it, they are too. I have seen Gigspanner on numerous occasions but tonight’s performance being in Hastings, where the trio formed and continue to play regularly, gives it added poignancy. A number of the songs and tunes tonight have a direct Hastings connection, including Seagull, a song recalling Knight’s days spent playing shove ha’penny in one of the local pubs, and Rolling Down the Bourne, a tune named after the main thoroughfare (and underground stream) which runs through Hastings Old Town where the Stables Theatre is based. Neither my words, nor the words from some cheesy promotional blurb but an off-the-cuff remark from a fellow audience member at Gigspanner’s performance in Whitstable. Fronted by Peter Knight, until recently the longstanding virtuoso fiddle player with folk rock legends, Steeleye Span, Peter is joined by Roger Flack on guitar and Vincent Salzfaas on conga drums. The three produce some truly amazing sounds together and, while there are undoubtedly strong English folk influences, their music embraces a whole range of influences, including French, Cajun and African sounds. While I was very familiar with Peter’s work in Steeleye Span, until I saw them for the first time two years ago I was only vaguely aware of his side-project, Gigspanner . And it’s a long time since a single act has had as much of an impact on me in such a short space of time, as Gigspanner has. Tonight is the sixth time I’ve caught up with them in two years and each time I’ve found their performance even more spellbinding than the last. At times Roger Flack’s beautiful melodic guitar reminds me of an early Peter Green, particularly on opening instrumental, The Butterfly. Combined with Knight’s haunting fiddle and Salzfaas’s beautifully subtle but infectiously rhythmic pounding of the congas brings a mesmerising start to the set. Dave Roberts French Waltz, another favourite of mine in the Gigspanner set, is an old French waltz that they learnt from the late Mr Roberts, Knight explains. They’ve never been able to find the original title so the title, Dave Roberts French Waltz, has stuck. There are songs, too. Those familiar with Steeleye Span’s large back catalogue will know that as well as Maddy Prior’s unmistakable vocals, there is often the odd contrasting but beautifully sung song from Peter Knight. Some of these, like Bonny Birdy and Seagull (Knight’s paean to the pub game shove ha’penny) are performed tonight, but given the unmistakable Gigspanner treatment. New additions to the set include a lovely version of folk standard, She Moves through the Fair, and a slowed down take on the old Steeleye favourite, Hard Times of Old England. 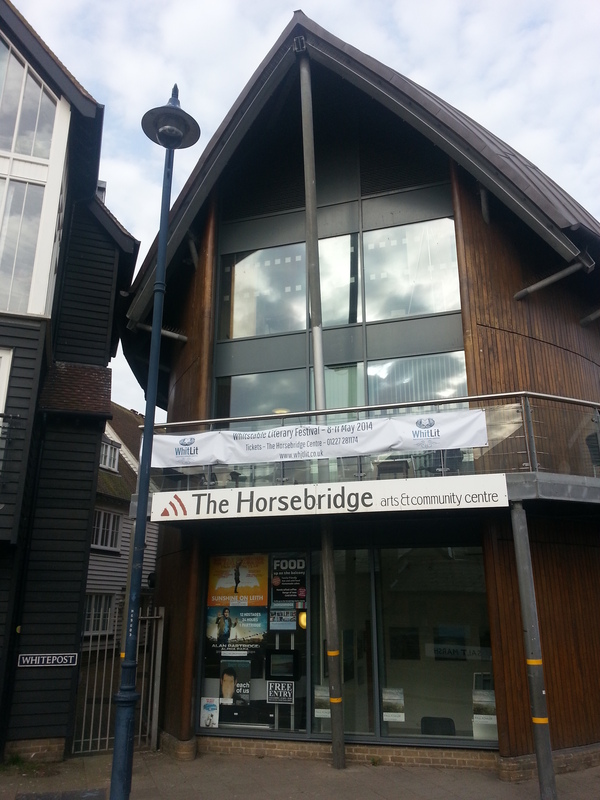 Although audiences at the Horsebridge, a beautifully constructed contemporary arts centre close to the seafront, generally tend to be on the restrained side they certainly showed their appreciation tonight and the standing ovation, whopping and cheering at the end of the set was thoroughly deserved. Gigspanner have now been performing several years and their first album came out in 2009. However, it was only at the end of last year that Knight finally said farewell to Steeleye Span. I’m a huge fan of both bands but when I read the announcement I felt a sense of relief that at least Knight was leaving Steeleye Span to concentrate on Gigspanner, rather than the other way round. Although a hard act to follow, Steeleye will, I’m sure, find an able replacement for Knight. What would be a real tragedy, as tonight’s performance demonstrated, would be if the world were to be denied more live performances of the wonderful and totally unique music of Gigspanner.